Yesterday I woke up and quickly got ready to head out to meet my bff, Katie, and her husband, Phil, at the Fashion Show Mall on the Vegas Strip. Phil wanted to add some nicer pieces to his wardrobe for the upcoming poker tournaments he’ll be playing in and I love helping people find clothes so of course I wanted to help out. We started around 11:45am and shopping til around 3 or 3:30. Both Phil and Katie picked up some great stuff, and I may have snagged a thing or two using my coupons at express and the limited. After a long shopping trip, Phil wanted to head over to the Wynn (such a beautiful property on the strip) for lunch. We decided on La Cave. A small lil wine and small plates restaurant. The menu at La Cave was very interesting. Everything sounded great! 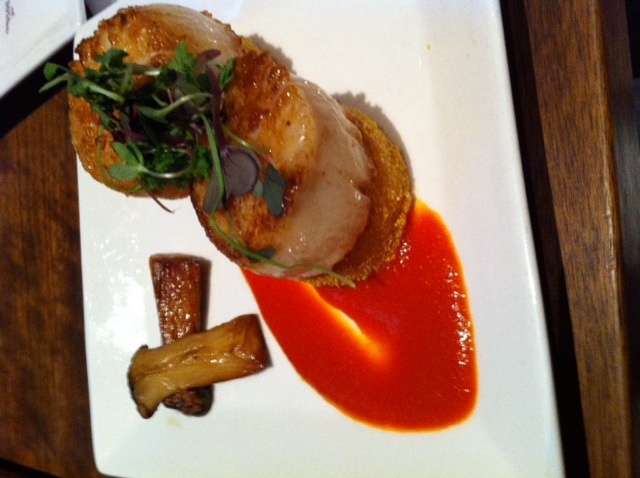 But when I saw the Diver Sea Scallops on the menu, I knew what I was ordering. Katie ordered the Angus Mini Burgers and Phil ordered the Caesar Salad and Salmon Sashimi. Katie and I each ordered a wine flight, while Phil ordered a beer. I tried their white wine flight, while Katie ordered the adventurous white wine flight. Of course I didn’t take any pictures of the drinks, but mine was okay (a lil too dry for me, I prefer sweeter wines) and Katie seemed to enjoy hers. 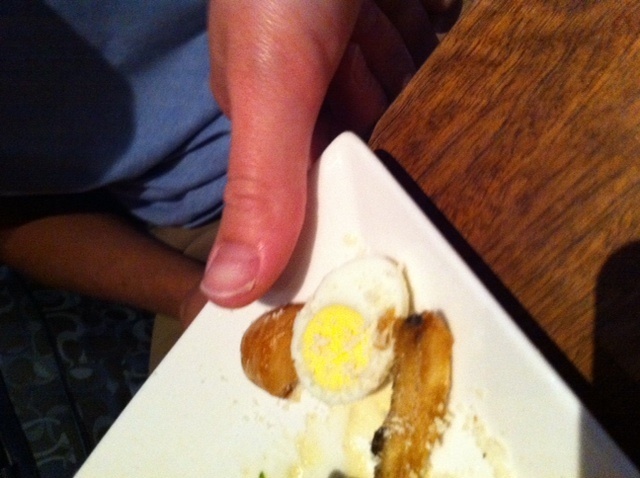 With Phil’s salad came the cutest lil egg. I made Katie put her thumb by it so you could see how tiny it was. By the time our meal reached the table I was starving! And omg it looked soo soo yummy. I was too into my own food to take pictures of anyone else’s but both Katie and Phil’s meals looking good and from what I was told tasted good as well! The scallops were on top of polenta and the sauce was a shrimp sauce. The scallops were cooked perfectly and the polenta was unreal good. It had a crispy outside with a smooth, creamy inside. The shrimp sauce was a great complement to the polenta and scallops. I’m pretty sure I could have eaten 2 more servings worth, it was just that GOOD. 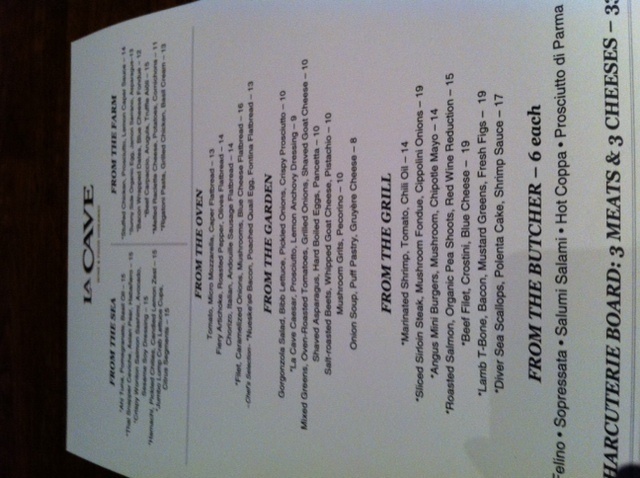 La Cave had great food and I would definitely go back there again. The good company was nice too! After a long day of shopping and a lil wine tasting, I was ready to relax for a few hours before I headed out to the Saturday Night Truck Stop. There will be a couple blog posts about that as well later in the week. What did you do this weekend? Eat anywhere new and fun?